"The real act of discovery is not in finding new lands, but in seeing with new eyes." "I do want to thank you for doing such an outstanding job so consistently, and for being such a benefit to small and mid-sized insurers and pools across the country." 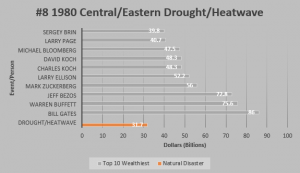 How Much Does a Natural Disaster Cost? In 1988, the drought/heatwave had a price tag of $42.4 billion. If the average person were to pay that bill, it would take 718,170 years to pay off. The U.S. suffered a number of natural disasters in 2017 that were catastrophic, but just how catastrophic? How much damage did these disasters cause? And how much does it cost to repair all the damage done? The charts below list the 10 costliest U.S. natural disasters, as determined by the National Oceanic and Atmospheric Administration. For comparison, each chart contrasts the amount of the damage from the event to the worth of the 10 wealthiest people in the U.S., as listed by Forbes. 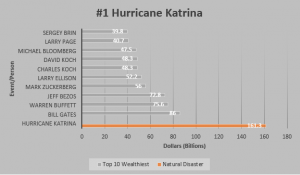 Hurricane Katrina was the costliest disaster to date at $161.3 billion. The tenth costliest disaster was Hurricane Wilma, totaling $24.5 billion. The list does not include the most recent disasters including Hurricanes Harvey, Irma, and Maria because the final cost of these storms are being determined. These comparisons illustrate how devastating these events are to the U.S. and its economy and why these events are so hard to overcome. 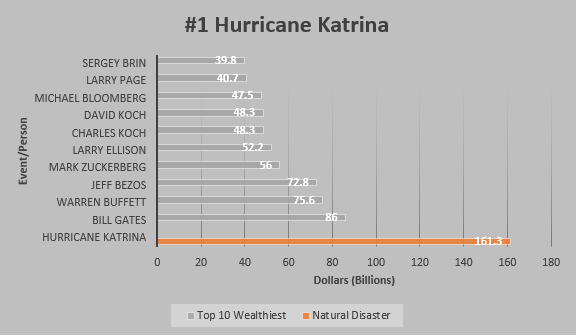 Hurricane Katrina (August 2005) cost $161.3 billion in damages and would require the top two wealthiest in the U.S. to pool their resources to cover the cost. 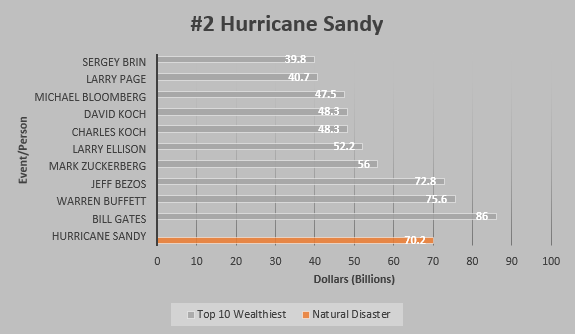 Hurricane Sandy (October 2012) cost $70.2 billion. Any one of the top three wealthiest could have written a single check to cover the damages and still been a billionaire. Hurricane Andrew (August 1992) cost $48.1 billion. The top five wealthiest Americans would still be billionaires if they single-handedly covered the cost of Hurricane Andrew. In 1988, the drought/heat wave had a price tag of $42.4 billion. If the average person were to pay that bill it would take 718,170 years to pay off. The Midwest flooding during the summer of 1993 resulted in a total of $36.1 billion worth of damages. This means that all of the top 10 wealthiest Americans’ worth exceed the damages. Damages from Hurricane Ike (September 2008) were just less than the Midwest flooding event, weighing in at $34.8 billion in damages. Any one of the top 10 wealthiest citizens could have paid it off, and some could have paid for it twice. The drought/heatwave in 2012 left behind $32.4 billion in damages. Any one of the top 10 wealthiest citizens could have paid it off, yet it would have required a full year’s salary from nearly 550,000 people making the average income. 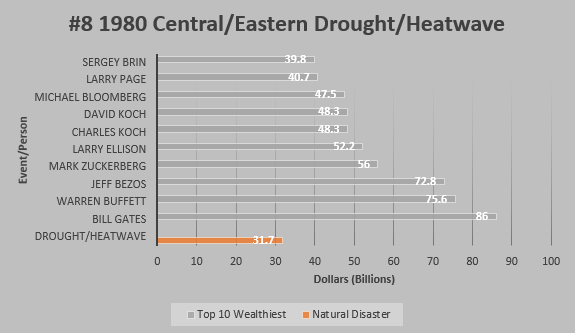 The summer to fall drought/heatwave of 1980 produced $31.7 billion in damages. Any one of the top 10 wealthiest citizens could have paid it off, yet it would have taken 50 people each earning the average U.S. salary 10,745 years to pay this off. Hurricane Ivan (September 2004) damages were $27.3 billion – well within the worth of any of the top 10 wealthiest Americans, but would take 462,407 years to be paid off by the average American. Hurricane Wilma (October 2005) cost $24.5 billion, within the worth of any of the wealthiest Americans. Even if 10 average Americans split the bill, it would take 41,498 years to pay off. Bio: John Dimond is an intern at Demotech, Inc. and attends Columbus State Community College. He intends to continue his studies in the field of engineering. He can be reached by cell at (614) 592-7256 or JDimond@Demotech.com. Demotech, Inc. is a financial analysis firm specializing in evaluating the financial stability of regional and specialty insurers. Since 1985, Demotech has served the insurance industry by assigning accurate, reliable and proven Financial Stability Ratings® (FSRs) for Property & Casualty insurers and Title underwriters. FSRs are a leading indicator of financial stability, providing an objective baseline of the future solvency of an insurer. Demotech’s philosophy is to review and evaluate insurers based on their area of focus and execution of their business model rather than solely on financial size. Visit www.demotech.com for more information.